Everyone is worth painting. From the many portraits I have made here is a selection of over sixty: academics, QCs, scientists, doctors, farmers, teachers, children, parents... From intimate family group to ambassador or peer, I aim to make a portrait as individual and characteristic as possible. A portrait can be an island of peace in a busy life. For the painter it takes the patience and attention of a hunter. For the sitter it also requires commitment but people are often surprised that sitting for a portrait can be an interesting and rewarding experience. 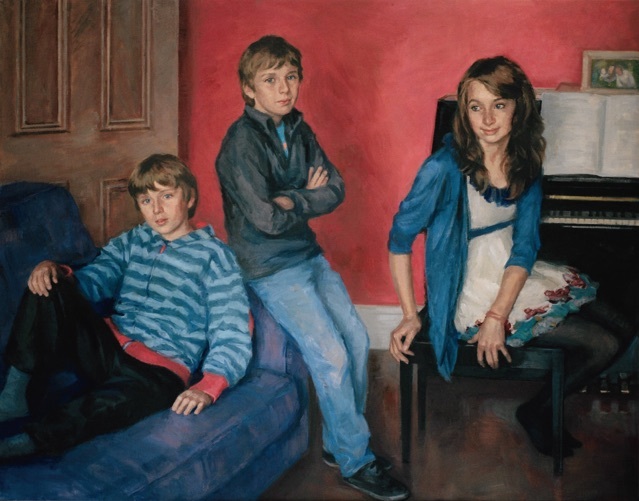 If you are thinking about commissioning a portrait, look at what would it would involve. I always respect tentative first enquiries so contact me if you would like to discuss a potential portrait. Above: Ned, Jamie and Ellen Atiyah. The subtle differences between the identical Ned and Jamie were difficult to achieve but fascination saw me through and Ellen was a delight to paint.